(AP) ORLANDO, Fla. - Officials with the National Hurricane Center had a message Tuesday for residents living in hurricane-prone areas: Don't tape your windows. Center officials are joining with a consumer advocate group at the National Hurricane Conference in Orlando, Fla. this week to encourage residents to skip taping their windows when a hurricane is heading their way. They believe it leads to a false sense of security and actually increases danger. Instead, residents should use proven methods such as hurricane shutters or impact-resistant windows, Bill Read, director of the National Hurricane Center, told hundreds of meteorologists and emergency management officials at the weeklong conference. Attendees are going to seminars on insurance policy and emergency communications as well as hawking hurricane-related wares such as canned food and building-hardening materials. "Our goal is to break this myth," Read said, referring to taping. "It does not protect your windows. At best, it's an inconvenience. At worst, some people have the illusion that they're safe ... and people can get severely hurt." Taping windows can create larger and deadlier shards of glass when winds blow through a home, said Leslie Chapman-Henderson, president and CEO of Federal Alliance for Safe Homes. "The shards can become bigger because they're being held together," Chapman-Henderson said. "You're wasting your time. You're wasting your money and you're potentially increasing the danger to your home." Even some disaster management officials are guilty of advising residents to use tape on their windows. 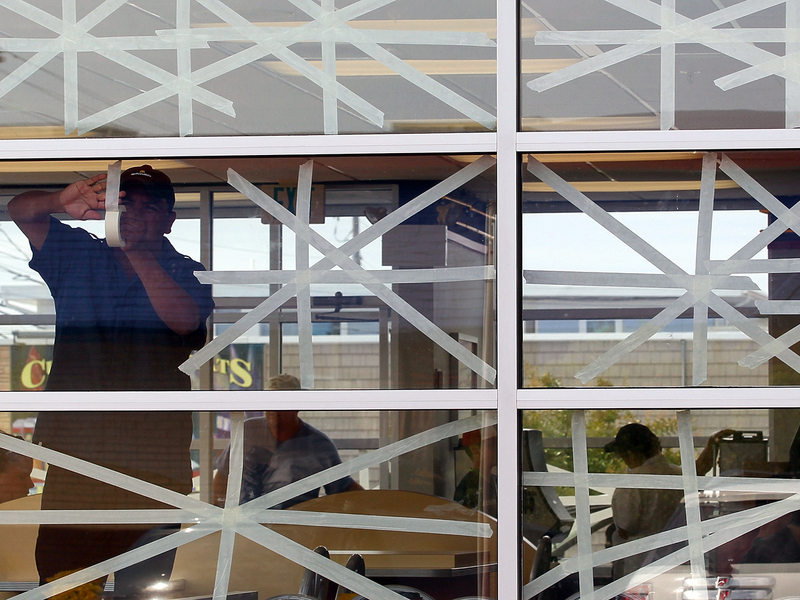 Read said when he started working in the 1970s, taping windows was still advised in hurricane brochures. That advice was eliminated from brochures in the 1980s, "but it still persists today," he said. Hurricane Irene's devastation last year in Vermont and upstate New York was an impetus for the campaign, said Chapman-Henderson, because thousands of residents in the northeast taped their windows. Her group is enlisting local TV meteorologists to tell viewers "Go Tapeless" at the start of the coming Atlantic hurricane season, which starts in June. Irene, which barreled up the Eastern seaboard last August and caused the most damage in upstate New York and New England, also reinforced the notion that hurricanes are not just about damage from winds and storm surges but also from rainfall and flooding and spinoff tornadoes, said Craig Fugate, administrator of the Federal Emergency Management Agency. Irene caused $1.5 billion in damage in New York and $515 million in damage in Vermont. Last season's 19 tropical storms, seven hurricanes and four major hurricanes tied for the third busiest season since records have been kept, officials said. "If nothing else, Irene reminds everyone that hurricanes are all hazards," Fugate said. "Who would have thought that some of the heaviest damage would occur in Vermont and upstate New York?"